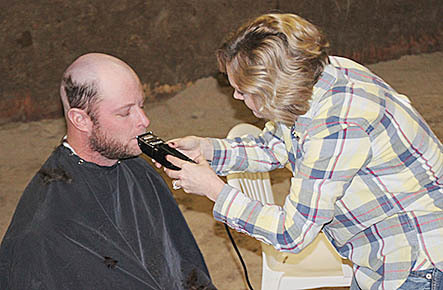 Wes Stokes gets a close shave from his wife, Jenna, during the fundraiser last Saturday. Five area cattlemen initiated a fund raiser that brought in more than $2,700 in just a few minutes for St. Jude Children’s Research Hospital last Saturday, Dec. 16, at Albion Livestock Sales. With a big crowd gathered for the annual special bred heifer and cow auction, Randy Pelster, auctioneer, announced the fund raiser plan. It started with donations of $100 each from Wes Stokes, owner of Albion Livestock; Jason Seier, yard manager, and Dr. Cody Gulbrandson, veterinarian, along with cattlemen Mark Niewohner and Pat Young. If more than $500 in donations could be raised from the crowd, they volunteered to stand for a live auction that would determine which ones received a “buzz cut” and which one(s) could retain their hair. Over $2,000 was raised from the crowd, and Mark Niewohner won the top bid in the live auction, choosing to keep his hair. That meant the other four would have their heads shaved, along with their beards and mustaches. Local barbers and beauticians Jenna Stokes, Brooke Stuhr and Sheila Leetch then went to work on their “customers,” Stokes, Gulbrandson and Seier. Joe Zwiener joined in with a clipper to shave Pat Young. It took only a few minutes for the four to take on a cue ball appearance, much to the delight of the crowd. The final totals were $2,729 for St. Jude and $244 for the Boone County Food Pantry.